The concern for introducing improvements into urban life concentrates on infrastructures: the provision of a fresh-water supply, and the establishing of rail and tram lines. Spanish military engineers, and in later years the civil engineers, worked in the Philippines and applied to the greater part of their works the most advanced construction techniques available at the time, leaving a significant legacy of their presence behind them in the Philippines. 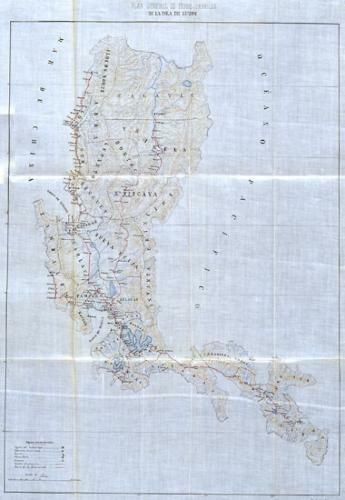 The General Plan for Railways was drawn up in 1876 for the island of Luzon, and included a network totalling 1,730 kilometers. A 192 Km stretch of track was constructed between Manila and Dagupan. This operated a regular service as from 1892. The most outstanding works carried out on the railway system were the bridge over the great Pampanga River and the building of Tutubán Station, in the Tondo district. The tremendous growth of the city of Manila led the administration to contemplate, in 1878, the setting up of a public transport network. Five tramway lines would link the city with its outskirts. The project for public supply of fresh water to the city dates from the early 18th century. Before this, the city had to be content with a fresh water supply based on cisterns. 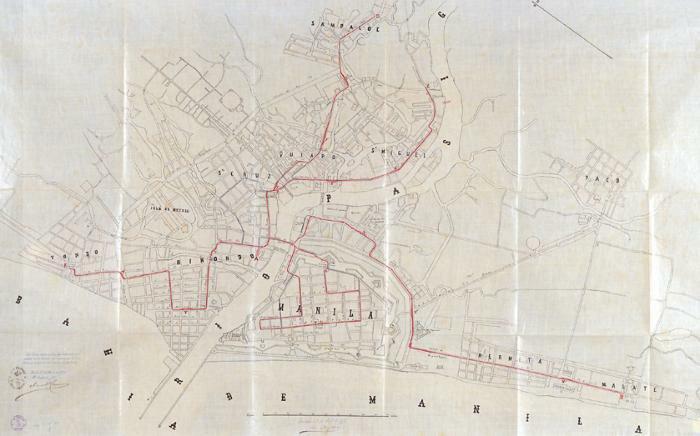 In 1867, the town council decides to take on the challenge of a project to supply fresh water to the whole of the city. In 1882 the first public water fountain gushed forth its waters, and shortly after this, the technology of the times was successful in providing Manila with a fresh water supply from sources up-river. Tutuban station on the Manila - Dagupan railway line. Revista de Obras Públicas. 1898 This had a distinct Hispano-Philippine flavour. It was built from masonry faced with brickwork at ground level, the upper storey being made of wood. It had galvanized iron roofing and an overhanging verandah, made from the same material, surrounded the building at first-floor level. Bridge over the great Pampanga River, on the Manila - Dagupan line. Revista de Obras Públicas. 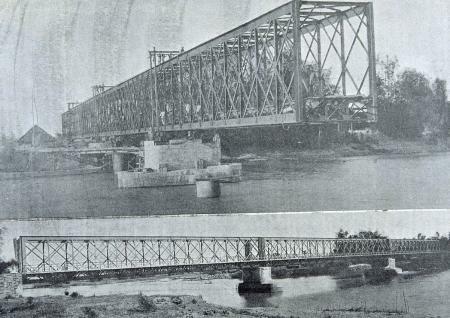 1898 Despite the difficulties involved in its construction resulting from problems in laying the foundations, this bridge with its lattice-work beams was one of the major achievements of Spanish engineering in the Philippines. Project for a railway station at Iligan. 1898. SHM After the opening of the Manila - Dagupan railway, the 1890's witnessed the promotion of studies and projects for new railway lines on Luzon and on other islands in the archipelago. 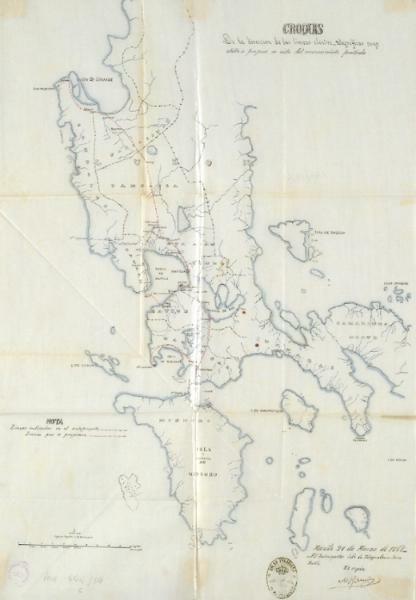 General plan for railways on the island of Luzon. Eduardo López Navarro. 1876. AHN The General Plan contemplated the construction of the lines considered to be most essential. Amongst these were the Manila - Dagupan line, and the Manila - Taal line, which were classified as being the first to be built, and as soon as possible. Plan of Manila with the general layout of the different tramways. León Monpour, approved by Manuel Ramírez Bazán, the inspector. 1878-1879. 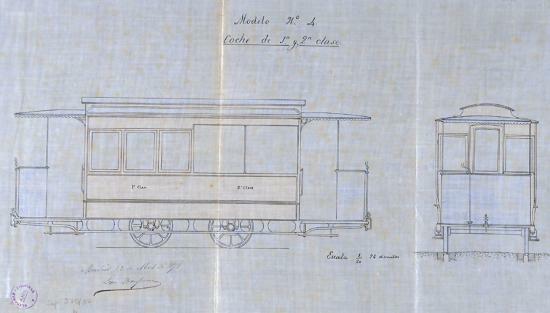 AHN In 1878, the concession for constructing five tramways in Manila and its suburbs was approved. The plan included a main station at San Gabriel and the crossing of the river via the "Puente de España"
Project for the supply of fresh water to Manila. Genaro Palacios y Guerra in Colección de planos correspondientes a varias de las construcciones realizadas o proyectadas por la Inspección General de Obras Públicas de las Islas Filipinas. 1876. BETSICCP, Madrid This was one of the most outstanding achievements of the Spanish engineers in the Philippines, and was one of the first in which steam engines were used to raise the waters. Map showing the project for the installation of telegraph lines. 1868. AHN The first telegraph lines were established on the archipelago as from the second half of the 19th century; these were linked to the international network and connected the islands with the mother country. General plan for the supply of fresh water to Manila. Genaro Palacios y Guerra. 1874-1875. 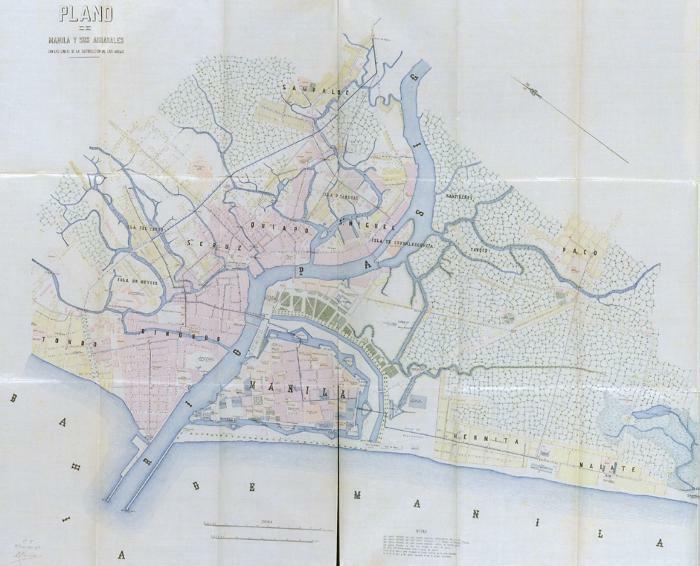 AHN This comprises the distribution layout from Sampaloc, on the outskirts of the city, as far as the Intramuros precinct and the districts near the port. Within the capital itself, subterranean sections were combined with others at ground level. Project to supply the royal fortress of Santiago with water. Narciso de Eguía. 1888. SHM Francisco de Carriedo y Peredo, a native of Santander and mayor of the capital, became its benefactor and patron when he left a bequest of ten thousand pesos to the city; this legacy paid for the installation of a water supply to military barracks and institutions.